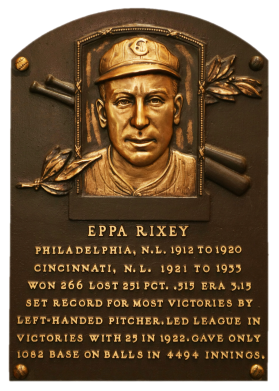 Eppa Rixey was a very good pitcher for some not very good teams, winning 266 games while losing 251. A workhorse and a master of control, Rixey won in double figures in 14 seasons and won 20 games four times. In 1922, his best season, he went a league-leading 25-13 for Cincinnati. Comments: I purchased a 1980 TCMA #99 of Rixey as a temporary placeholder tribute card until I found an issue contemporary to his career that I liked. It was submitted to PSA and graded MINT 9 in July, 2002. 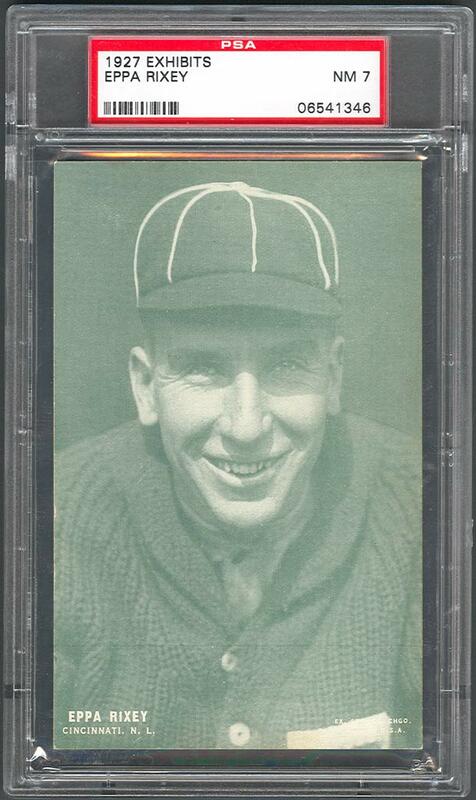 In March, 2004 I won an eBay auction for a raw 1925 Exhibits card. 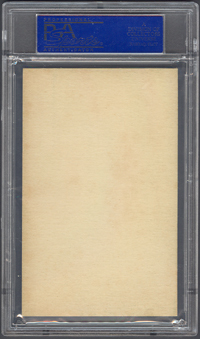 The card was submitted to PSA, graded EX, and sold in March, 2005. 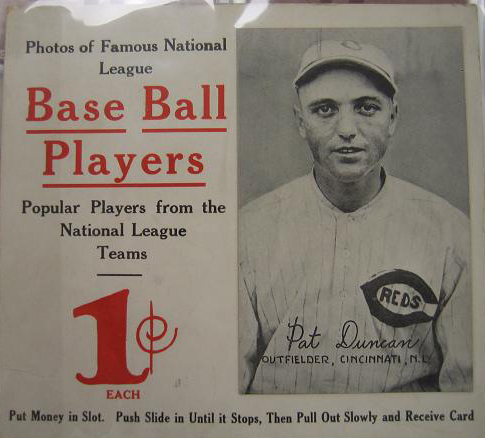 I also purchased a 1922 Exhibits card in September, 2004. The card was submitted to PSA and graded NM 7. I also had umpires Bill Klem and Billy Evans representing the 1922 Exhibits issue so I was open to finding a different Rixey card. 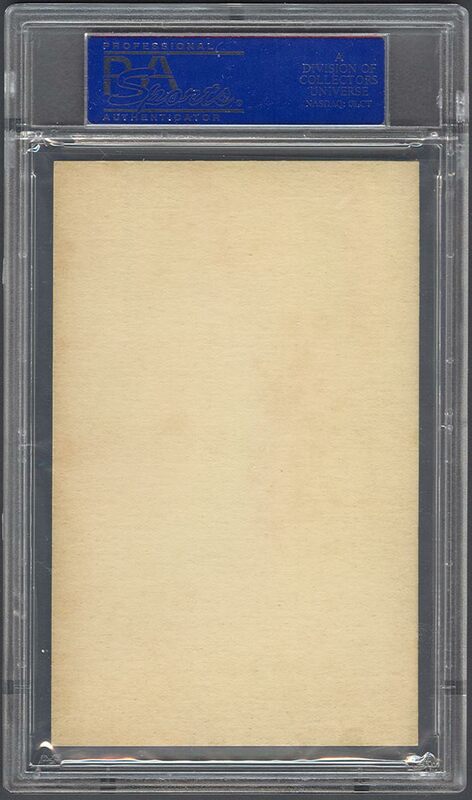 In December, 2007 my records show I traded away my 1922 Exhibits PSA 7 straight up for this beautiful NM 1927 Exhibits card. I didn't have the 1927 Exhibits issue represented in the collection. I just don't recall with whom the trade was made. I'd love a E123 Curtis Ireland Candy issue for Eppa but have only been able to track down a single copy (the owner doesn't want to sell). Description: The Exhibit Supply Company issued a set of 64 cards in 1927, each measuring 3-3/8" X 5-3/8". The set can be identified from earlier issues by its light green tint. The player's name and team appear in capital letters in one lower corner, while "Ex. Sup. Co., Chgo." and "Made in U.S.A.: appear in the other. All 64 photos issued in the 1927 set were borrowed from previous issues, but 13 players are listed with new teams.